Frank Sinatra, in the lyrics of one of his songs, suggested that we make all the stops along the way. This is the same gentleman who declared near the close of his career that he did it ”My Way” meaning, of course, his way. At the start of many of his concerts, audiences were reminded that they were “in his room”. And so on. And that brings me from Sinatra…to the front kick. What if we explored the little meanings of all the stops or points from the beginning to the finish and then the retraction of this basic of all kicks shared by so many systems of martial arts? The reason for this little technical outing is due to what often times occurs during sparring practise. As when we’re standing in a stance, performing kicks against an imaginary target, we line up a target, this time a live one, in the hope of connecting the ball of our foot with his stomach or his chest. Or perhaps his head. That’s the ideal world. We practise our speed, distance and timing for just that reason. 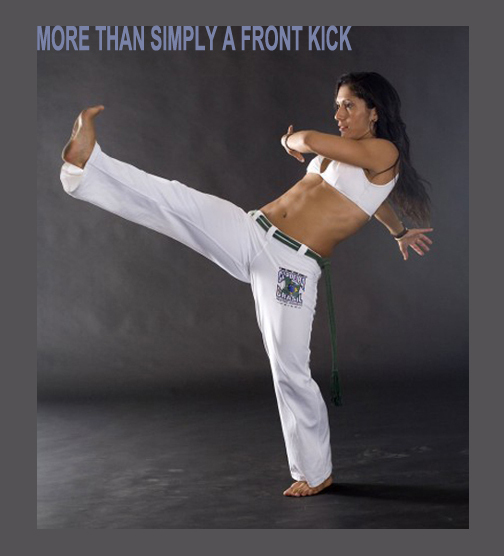 Our front kick must always reach a satisfying conclusion. But sometimes objects in time and space refuse to co-operate. Our sparring partner might be in on us before we can snap out our kick. Or she might have shifted to the side, leaving us stuck with throwing a straight line kick, or having to comply with a new point of reference. That’s why I remind my students training in Heian(Pinan) Yondan, for example, that they should have a sense of every point along the front kick’s trajectory. So what are the mysteries of one of the first kicks beginners usually learn? OK, my left leg is out in front. I’m going to kick with my right leg. As my right leg begins to move even a quarter of an inch, I can strike a target very close in front of me with a bit of my right hip or with the very top of the femur. I’ve hardly moved but with the use of “short power” I might have already driven into a significant target at very close range. This is one reason why strong stances, hip rotation and a vigorous shifting from one stance to the next are so crucial, and why one’s centre of gravity should be kept low. The distance from hip/leg to target is again minimal, a few inches at best. Nevertheless, the destructive impact can prove to be exceptional. Possible targets: the entire outside or inside of the attacker’s leg. His groin, of course. The back of his knee. Can you imagine a Judoka or a Jiu Jitsuka, giving the inside of an attacker’s right leg such a short and powerful smash, then reaping back against the inside of his left leg for a throw? 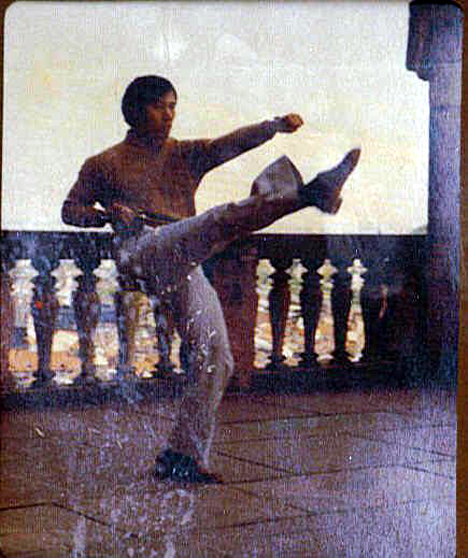 The front kick now begins to rise toward its chambered position. Here is where we hit forward and upward with the thigh and the top of the knee. The shin (tibia) hasn’t come into prominence just yet. Again, going back to Jiu Jitsu and Judo, this is where you raise your leg to commit to an osotogari (outer reaping throw). You can still do the throw…after you’ve used the initial raising of the leg as a kick. Friends in Southern Crane and Goju Ryu Karate will certainly recognize here the stepping patterns you practise. 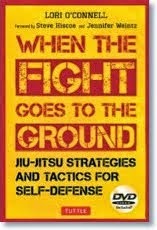 Every time you slide an inch forward, you’re attacking the assailant’s foundation. So now we arrive at the point where the knee is raised and the bottom of the leg is preparing to snap out in front. 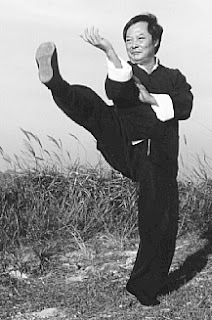 Returning to the Kata Heian (Pinan) Yondan, how often do we just plow right on into the final extended point without “feeling” the knee portion of the kick? Certainly, we’re taught to consider an opponent to be in front of us, an imaginary attacker…so why can’t she be close enough so we can establish kime points all along the way? Fluid kime points. For example, when practising the Kata, why can’t we concentrate on the chambered position as a point of attack? How about a double kick? The knee drives up into the groin, then the shin bone (tibia) slices up from underneath the groin. Not for the faint of heart. Friends in the military. Tell me of a mission that goes completely and precisely according to the smallest detail of a pre-c0nstructed plan? Granted, there is always a mission plan but the strength of a proposed plan also lies in its flexibility to adapt. Every inch down along the leg is a weapon, part of the military column that begins with the knee cap (patella) and ends with the ankle, all courtesy of our basic front kick, whatever our art may be. And then there is the top of the foot…and then the ball of the foot underneath, and the toes for fine pressure point work. A good toe kick spearheaded by the tip of a woman’s shoe deep into the femoral area is as effective as using the ball of the foot. Look for throws, sweeps, takedowns and secondary kicks. They’re brutally effective. 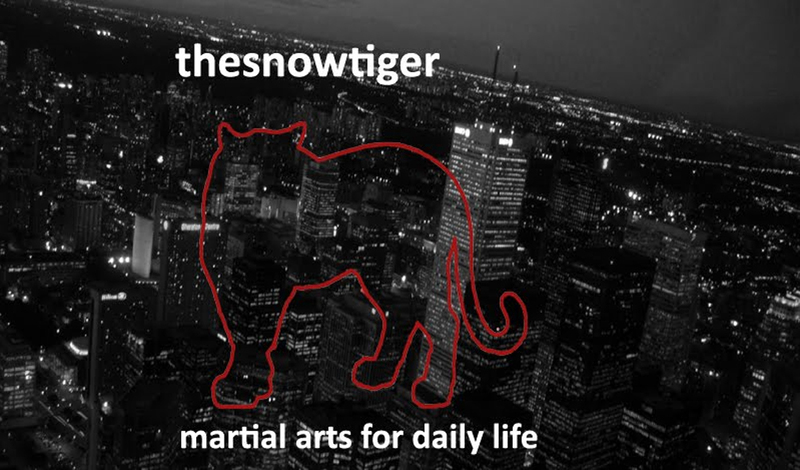 As the leg snaps back into the chambered position – and as the foot returns to its initial stance - we find an extraordinary number of medium to close range sweeps, takedown, hacking and slicing backward kicks. In fact, the return to stance symbolizes a stomp through a joint, possibly as well a downward stripping of the Achilles tendon, and certainly a crushing of the tarsals and meta-tarsals. Back to Karate Kata, that’s what is happening between the start and the end of the front kick, only in the Heian (Pinan) Yondan Kata, the right leg stomps down in front, which is another story. So we have a ton of weapons offered to us via one kick lying somewhere near the centre of a given Kata such as Heian (Pinan) Yondan. Coincidence? I hazard to guess that the folks who constructed Kata, patterns, forms, etc. might have had a desire to infuse the movements with as much combat material as possible. After all “martial art” is “war art”!